The California outfit is set to place an important new platform in orbit for SES to serve its television customers in India and parts of South East Asia. It is the first time SpaceX has attempted such a mission. Success will require its Falcon 9 rocket put the SES-8 satellite thousands of km above the Earth. If it works, SpaceX is sure to win more orders in a market that is tightly contested, but which has become dominated in recent years by just two companies – Europe’s Arianespace, which flies the Ariane 5; and International Launch Services (ILS), which markets Russia’s Proton vehicle. SpaceX is promising to substantially undercut the pair on price, and SES, the world’s second largest telecoms satellite operator, believes the existing players had better take note. "The entry of SpaceX into the commercial market is a game-changer – it is going to really shake the industry to its roots," said SES CTO Martin Halliwell. "Other launch vehicle providers are looking with great interest in the success, or not, of this launch, and I think they will be rather worried for their future," he told BBC News. 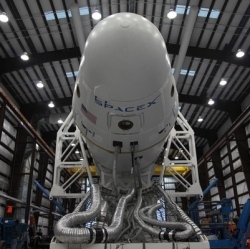 Monday’s flight from Cape Canaveral in Florida will be the seventh flight for a Falcon 9. All of the previous missions have gone to low orbits just a few hundred km above the Earth. This was work done mostly for the US space agency (Nasa), to keep the space station stocked with supplies.